I got the shock of my life when we saw not one, but two beating hearts during our first ultrasound (7 weeks) of our "Surprise!" 5th pregnancy. She said, "Here's the sac.....Here's the heartbeat...." Then there was a long pause and she was moving the wand back and forth and back and forth. Then said, "And the other heartbeat...There are two babies in that sac!" I was floored. I saw the other heartbeat but I thought she was just looking at a different angle! I knew I had double ovulated that month due to them finding two corpus luteum cysts when I had an ultrasound around 4.5 weeks for pain. However, these babies appear to be in the same sac, which would make them identical and from the same egg, not two different ones. The tech couldn't tell if there were two yolk sacs or just one and had a hard time getting a picture of them together because she said they are "right on top of each other". I am 3-4 days behind what I thought but the babies are measuring within 1 day of each other so that is good. Since things are so ultra-tiny right now, we'll know more at my next ultrasound which will be at 10 weeks. I'll post my next pic then! im in the same boat i have 4 babies already , i had my ultras sound at 5wks 4day there are two yolk sacs but in the same sac(identical)they were on opposite sides of each other >>example (0 0) <<< i will be back there in 4 days to check for heart beats, 0ne is al0t smaller than the 0ther ,im s000 scared , has this happened t0 any 0ne else bef0re? I am also 5 weeks and 2days and had an ultrasound with one sac, 2 yolk sacs. still too early to see any babies, so going back in 2 weeks. But it could be identical twins, or one baby or it could be a miscarriage. Won't know till my next appt. Usually more then one sac or yolk sac could mean twins or more. But it has been seen where it looks like theres more then one and it turns out to be just one. You'll have your answer at your next appt when they have gotten a little bigger and you can see more. Good luck! Help 5w2days u/ showed 2 possibly 3 sacs but I have been told to come back at 6 weeks o confirm how many. Could this be twins???? Hi all, was wondering, out of all the mothers that posted how many of u have twins running in ur family. Or if any1 knows if u can have identical twins with no genetic family history. I recently found out I was pregnant, when I went for my ultra sound the tech said he saw two heart beats but wasn’t positive; so he scheduled me for another apt two wks later. I can’t wait though I'm in complete suspense, from what I can see if they are twins because I too saw two heart beats they'd be in the same sac right on top of one another. Here’s my question do you think the tech is right or was it a glitch or mistake of some kind? Twins would be great but I have no history of them in my family or my husbands and this was a natural conception with no fertility drugs involved. I'm just not sure; your input would be greatly appreciated. my ultrasound is also similar to yours but my two yolks are close together at this stage my doctor was still not sure and told me to comeback on my 3rd month which is five weeks from now can't wait to here more from your progress. I'm now 7 weeks and 1 day preggies. Hello, I just found out 2 weeks ago that now on my third pregnancy I am having identical twins. They cannot tell if they are if there are 1 or 2 sacs but they are in the same placenta. On my ultrasound at 6 weeks 5 days the heartbeats were completely opposite of eachother. One on each side of the placenta lol. So it was beyond a shock when after looking at one heartbeat the tech rolled up and saw another one. Its one of the most amazing feelings in the wolrd! Congrats to everyone! i had an early ultrasound at 5 1/2 weeks. since the embryo is too tiny to see at this time, the tech was looking for the yolk sac. she found two which were the same size. the dr. was sure that this was a monozygotic pregnancy. the second ultra sound showed only one embryo and h/b. the tech commented that she could see the remains of the other embryo (being reabsorbed). this week (8 wks) they did another ultrasound which showed one embryo, one h/b but 2 yolk sacks (not next to each other). what could this mean? Hey! I'm 13wks 4days pregnant with identical twins. At my 7wk u/s it appeared that my twins were in the same sac. 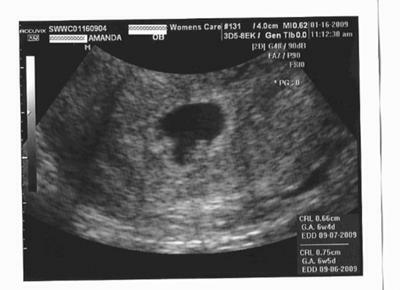 When I went to the Perinatologist at 11wks, they saw the membrane that seperates my twins. They do share a placenta though. I just thought I would share and hopefully give you hope. I was told it was too early to see the membrane at my 7wk u/s. They couldn't give me any answers at that point. At 6 weeks 1 day (our first ultrasound after IVF confirmed pregnancy) they saw two embryos with heartbeats in one sac. They referred us to a perinatal specialist who stated that they are mono-mono while in the same sentence "I have never diagnosed anyone this early". We are going to see 2 other specialists because we think it was a premature diagnosis. Our ultrasound looks very similiar to yours so I am interested to hear what you have been told.